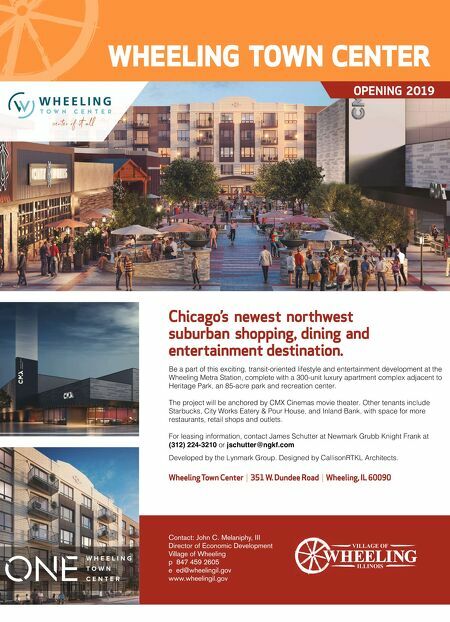 Be a part of this exciting, transit-oriented lifestyle and entertainment development at the Wheeling Metra Station, complete with a 300-unit luxury apartment complex adjacent to Heritage Park, an 85-acre park and recreation center. The project will be anchored by CMX Cinemas movie theater. Other tenants include Starbucks, City Works Eatery & Pour House, and Inland Bank, with space for more restaurants, retail shops and outlets. For leasing information, contact James Schutter at Newmark Grubb Knight Frank at (312) 224-3210 or jschutter@ngkf.com Developed by the Lynmark Group. Designed by CallisonRTKL Architects.